The Director of this Irlen Clinic, Julie Yaxley MA, discussed Irlen difficulties and how these could be overcome using free or inexpensive Apps that could be used on tablets/phones/ipads. The Texas Irlen Annual Conference took place on Saturday 21st January 2017 in Austin. It was well attended by Diagnosticians, Screeners, clients and parents. There were presentations covering a variety of Irlen issues. 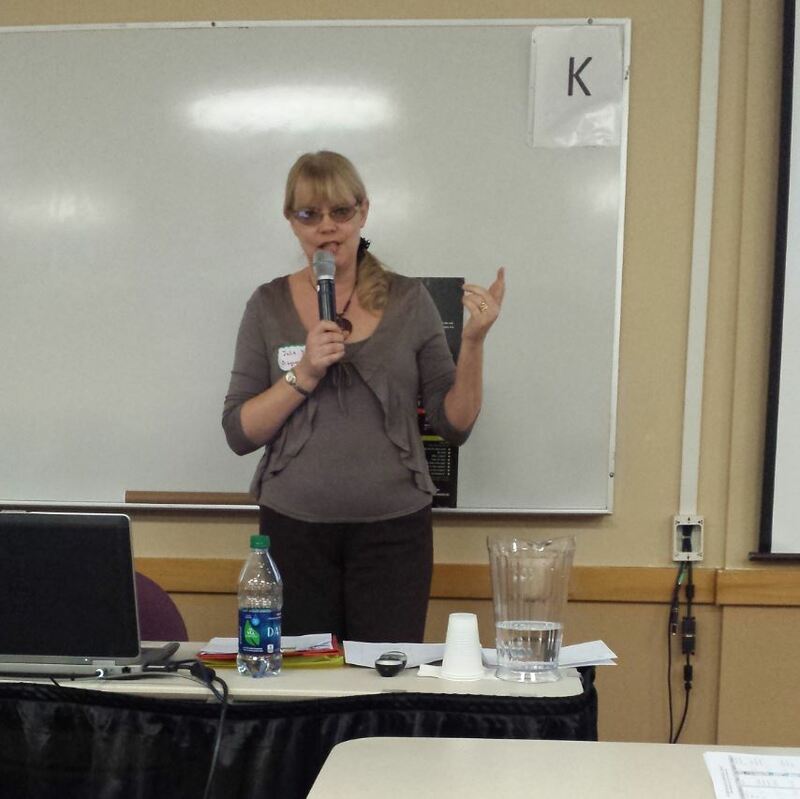 At this conference I discussed how to 'level the playing field' for those with Irlen Syndrome by examining Apps to support different areas such as reading, reading comprehension, writing, handwriting, note making and Math. For each area I suggested ‘tried and tested’ Apps and explained how I had used them for myself or in my teaching sessions. If you want to be emailed a copy of the 'App list' please fill out the contact form on this website. At the conference special thanks were given to Dr Sandra Tosca for flying out from the Irlen Institute in LA to provide an update of current Irlen research - exciting information from brain research showing that color affects many aspects of brain function and how Irlen Spectral filters can ‘normalize’ an overactive brain where timings are not correct. She also pointed out other populations who can be helped by the Irlen Method, those with: Autism, Tourette’s, ADHD, Migraines, Brain injury, Chronic fatigue, Stroke. It was also great during the Conference to Skype with Helen Irlen herself who reminded attendees that when the brain is continually under stress (for instance from bright lights) Irlen Syndrome can bring on: panic, anxiety, irritability, disorientation, brain fog, fidgetiness and ‘flight or fight’. Screeners and Diagnosticians must ask about these symptoms! Indeed many at the conference particularly reported that fidgetiness was stopped by Irlen overlays/Filters. Dr Sandra Tosta in her talk had already discussed pre and post assessments (military study) which showed that physical symptoms such as light sensitivity, migraines, headaches, eye strain/pain, dizziness, nausea and stomachaches showed the largest improvements with Irlen Filters. 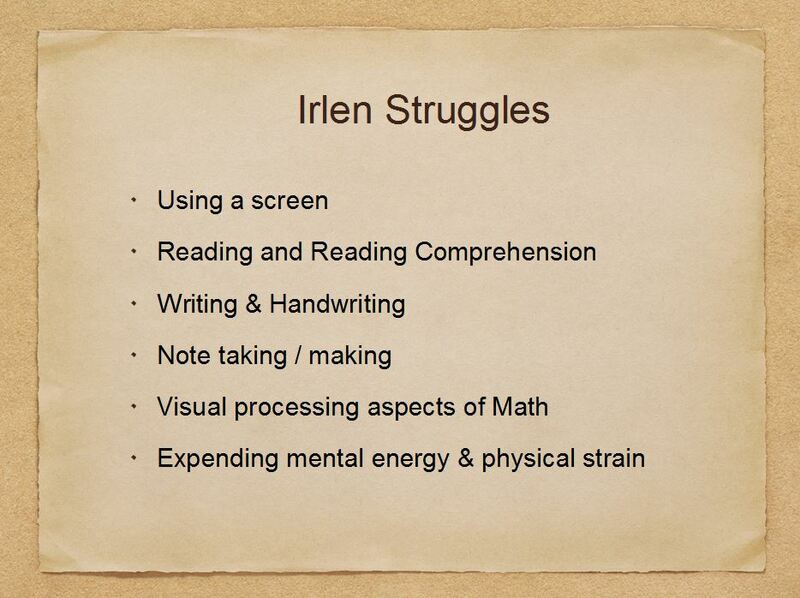 So the message is Irlen Syndrome is not just about reading, but about health and well being! The last part of the Conference involved a panel of parents and children who explained their path towards discovering their symptoms were related to Irlen Syndrome and how the overlays/Filters had helped alleviate them - often after many other fruitless investigations which left them concerned and anxious as the underlying cause of difficulties could not be found. One student addressed Diagnosticians and Screeners directly asking them to carry on educating about this syndrome as the Filters had changed her life so dramatically! A great way to end the conference with an incentive to change more lives! ... So come on down to the Clinic and let me find out if Irlen overlays and Spectral Filters (special tinted glasses) can help you and change your life too! !